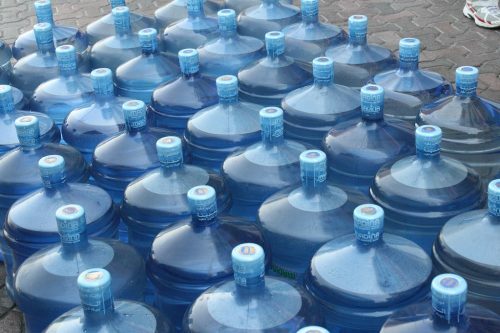 Most expats and locals buy large bottles of drinking water, like those pictured above, delivered to the home. But other water for showering, brushing teeth, laundry, washing dishes, is best not brought home from a polluted aquifer, or contaminated waterlines. The engineer explained that the e.coli count here was now extreme — beyond the ability to be easily treated for piping into homes. I’m a country boy; I’m not squeamish, having lived on a farm for many years. We had wells. I learned how to manage water from shallow wells to make it suitable for drinking. This article will address water treatment only for normal washing purposes — not for drinking. There are additional technologies for processing water for drinking. (Hey, the astronauts process human urine to make it fit for drinking!) But a cost-effective approach for water treatment by homeowners in Merida would be simply to buy drinking water, and treat the rest, as described below. Most people quickly mention chlorine when talking about reducing bacteria in water. That’s ok for swimming pools, rinsing the body immediately afterwards, but it’s not suitable for household use, as chlorine forms strongly-toxic trihalomethanes after contacting organic compounds in water. Large water treatment facilities do use chlorine, but they also use huge charcoal filters to remove toxins after treatment. A healthy approach for residential (non-potable) use is to kill bacteria using ultra-violet light, thus saving the cost of charcoal treatment to guard against bad effects from chlorine. Any plumber can install such units. The instructions of this brand are written in English, Spanish and French. The product is made in Canada, where the brand is named Viqua. In US the same product is called Sterilight. I bought this new one from Amazon Mexico, where it is called Viqua. The photo below is what it looks like installed. The u-v bulb is long, varying in length by the capacity of the unit. All units need bulb-replacement after 365 days. (Be sure the installer allows enough clearance to slide the bulb out — double the length of the unit.) The electronic control counts down from 365 days, and sounds a tone when a new bulb is needed. (The tone can be silenced for a time, allowing a grace period, but will return if you haven’t replaced the bulb when you should.) Also, I suggest using a surge protector on the power supply to protect the device. I had my water tested on the farm before and after installation, as we were drinking from the well. The device if effective. During installation it’s important to do a one-time chloro treatment of household waterlines and tanks to purge bacteria from the system downstream of the u-v light, which should then prevent regrowth of cultures. NB: if you have a pressurized system or hidraulico (heavier tubing), you may not see the light from the unit thru the pipes. Not to worry. (We have a gravity system with thinner tubing, and therefore the light shows thru.) After installing, you can shower, and brush your teeth in peace.